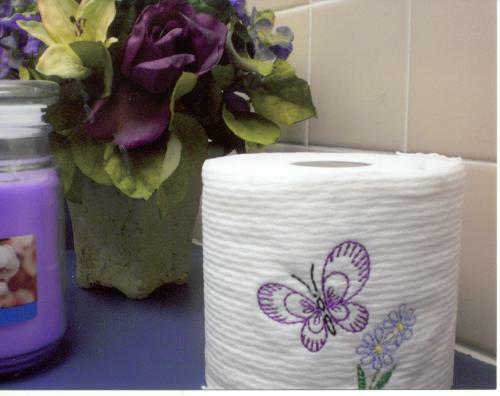 I have it on good authority that the ladys’ room at the Westerville, Ohio Senior Center has a roll of embroidered toilet paper. How do I know this? Madeline H. takes her camera EVERYWHERE! Entry filed under: Miscellaneous Musings. Tags: Ami Simms, embroidery, toilet paper. What’s in my bathroom? You don’t want to know. I’ve embroidered on toilet paper just to see if I could. She is not the only one! I also take my camera everywhere………. and my camera found the beautiful bathrooms at the American Club in Kohler, Wisconsin. You know that if the town is named Kohler the bathroom fixtures must be beautiful and the bathrooms in the American Club are so fabulous I took tons of pictures! The toilet paper is folded over the rollers in a delightful origami display. The hand towels are paper but they feel like linen and they are even embossed with the hotel name! Do you know when I got rid of my embroidery machine??? The day after I embroidered TP, I figured that was a new low and decided to more on to more productive things!! !